Rider Mania, Royal Enfield’s marquee riding festival, is the ultimate destination for adrenaline junkies that brings together Motorcycles, Mates and Music. From dirt track to assembly line races, there is something for everyone. With each passing year, the event keeps growing larger and grander. The 14th edition of Rider Mania, held in Vagator (Goa), witnessed a staggering participation of 6,000+ riders, media and influencers from all across the country. Amongst the world’s largest community rides organised by Royal Enfield every year in April, the One Ride 2016 witnessed a record participation. Who says adventure motorcycling is just for men, it’s an exhilaration that equally revs up the women. This year’s first ever women’s edition of the Himalayan Odyssey proves exactly that. 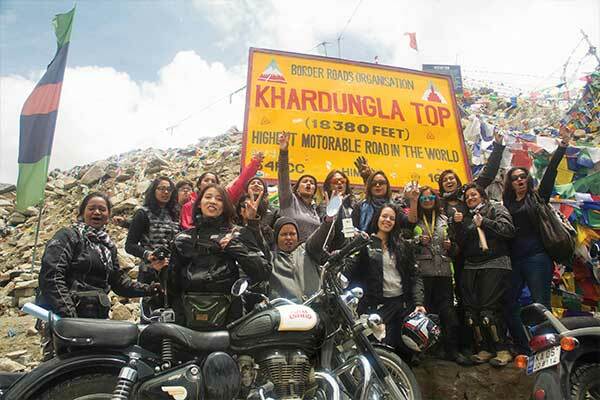 As an all women contingent comprising 20 participants throttled their way up to Khardung La, they broke several Indian women stereotypes. Only for the fearless, the Himalayan Odyssey is one of the most challenging and gruelling adventure expeditions where participants cover a distance of over 2,300 kms, riding through three mountain ranges and six passes to reach Khardung La, one of the highest motorable roads in the world, at an altitude of 18,380 feet. "I am a commoner from a small village in Kerala. Being a slim built woman owning a 190 odd kg motorcycle, an 18-day trip covering a distance of 2,300 kms on one of the most difficult terrains on earth is something that I had not dreamt of in my entire life. Trips like this challenge your limits, shatter all kinds of fear within you and make you more complete as a person. From swollen hands to punctured tyres, fellow passengers meeting accidents to altitude sickness, landslides to tricky roads filled with mud and naalas (water bodies), rainfall to thick mists, hair pin curves to broken rocks blocking the roads, it was the most daring expeditions that an adventure biker can ask for. This trip totally transformed me as a person and the way I see the world. All in all it was a once in a lifetime opportunity."